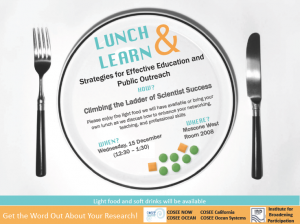 Scientists, please join your colleagues and representatives from several COSEE centers and the Institute for Broadening Participation for a discussion on how you can enhance your networking, teaching, and professional skills. Scientists are increasingly being asked to become more involved in communicating the broader impacts of their work. With the threat of a declining scientific workforce and an increase in public literacy on ocean and aquatic science issues, the time is now for connecting ocean science research and public education. Please join us for a workshop that includes discussions and demonstrations to address skills such as assessing prior knowledge of nonscientist audiences, understanding learning theories, and finding or developing simple, practical educational tools.